4Videosoft iPad 3 Manager Platinum is a professional iPad 3 Transfer software, which can transfer TV shows, Podcast, iTunes U, eBooks, ePub, voice memos, SMS (MMS) and contacts for iPad 3. Moreover, it can support latest iOS 6 and iTunes 10.6 now. shows, Podcast, iTunes U, eBooks, ePub, voice memos, SMS (MMS) and contacts for iPad 3. 6 and iPhone 5 and adds the function of digital signature, iMessage and contacts. MOV To WMV Converter is a very easy to use conversion software. It can convert almost any file with MOV extension. 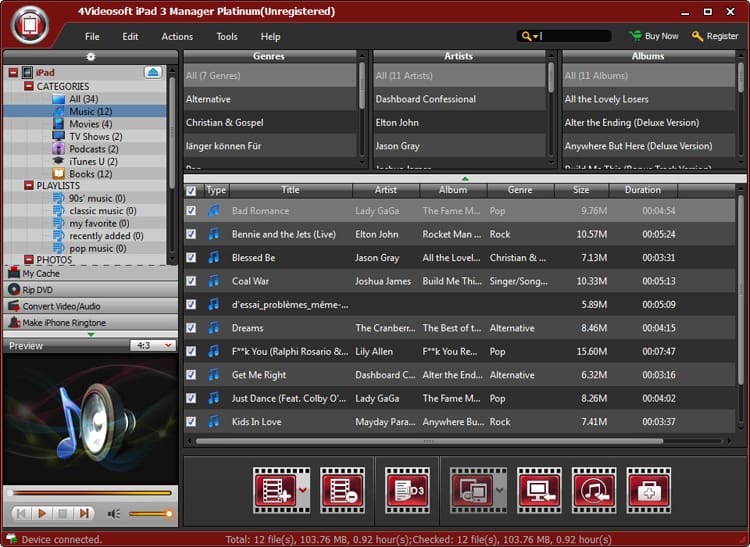 Aiseesoft iPad 3 Video Converter is the best iPad tool, which can help iPad users put favorite movies/music on iPad 3. With it, users can convert any video/audio to iPad 3 compatible formats. Aunsoft MKV Converter is a feature-rich MKV Converting tool, which can let you decode and encode MKV files to lossless video formats like MP4, MPG, AVI, WMV, 3GP, etc for playing on iPad, iPod, iPhone, PS3, etc. It is also a great MKV editor.